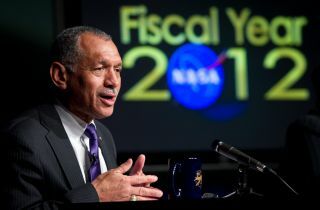 NASA chief Charlie Bolden visited Capitol Hill today (March 2) to defend the space agency's 2012 budget request against detractors in Congress who said it didn't adhere closely enough to the plans they approved last year. The debate, heated at times, came down to how much money NASA will spend encouraging the development of commercial spacecraft compared to the funding allocated to building NASA's own next-generation space vehicle. President Barack Obama has proposed an $18.7 billion budget for NASA in 2012, one that would keep it locked at 2010 levels. Last year, Congress passed – and Obama signed into law – a bipartisan NASA authorization bill. While that act did include funding for privately developed spaceships to take over the job of transporting astronauts to low-Earth orbit and the International Space Station, it also instructed NASA to start building a heavy-lift rocket for future spaceships as a backup. That change had some lawmakers up in arms today during hearings of the House Committee on Science, Space and Technology. "While last year's Authorization Act was by no means a perfect bill, it did clearly articulate Congress' intention: that NASA pursue a means of transportation that builds on all the work that’s been done over the past five years," said the committee's ranking Democratic member, Eddie Bernice Johnson (D-Texas). "I do not see it reflected in the proposed NASA budget request." The committee's chairman Ralph Hall (R-Texas) agreed. "The new budget proposal disregards — yes, ignores — our authorization law," Hall said. Bolden argued that the 2012 budget request does follow the guidance of the bill. "I get your message loud and clear and so does the president," Bolden said. "I think the budget does, in fact. reflect following your guidance." Bolden acknowledged the redistribution of funds, but maintained that commercial spaceflight still receives less money than any other sector in NASA's human spaceflight portfolio. "Because these are tough fiscal times we also had to make some difficult choices," Bolden said. "Reductions are necessary in some areas so we can invest in our future." Some lawmakers object to the new privatization push because they don't trust commercially built spacecraft to be as safe as vehicles owned and operated by NASA. "Trying to stimulate commercial competition is a worthy goal that I support, but not at the expense of ensuring the safest or most robust systems for our astronauts," Hall said. "There are simply too many risks at the present time not to have a viable fallback option." Bolden disagreed that private spacecraft are any less safe than NASA's, which have traditionally always been built, and operated, through commercial contractors anyway. The new model, he said, was mainly a different acquisition format. "Safety of our crew is always my priority," Bolden said. "The best, most efficient, perhaps fastest way to do that is by relying on the commercial entities. Anyone who would try to convince you that American industry cannot produce is just not being factual." Commercial spaceflight did have some backers in Congress today, including Dana Rohrabacher (R-Calif.), who introduced a letter signed by over 55 space leaders promoting the private space industry. "These credentialed experts are urging that NASA fully fund the use of commercial companies to carry crew to the station because it is a strategy that is critical for the nation's success in our space efforts," Rohrabacher said. He compared having the government manage, operate and build all the space transportation vehicles today to people who wanted the government to manage all aircraft 20 or 30 years ago. The debate comes as Congress is trying to settle on a budget for the 2011 fiscal year. So far, NASA and the rest of the federal government have been operating with 2010 funding levels under the current continuing resolution. Today the Senate passed a House resolution that would extend funding another two weeks to buy them a little more time, but the outlook for a longer-term budget is not yet decided. While some in Congress are aiming to make drastic cuts to many federal programs, others are seeking to protect funding for NASA. Obama's 2012 budget request would keep NASA at 2010 funding levels. "It's extraordinary that you're defending the president's budget," Johnson told Bolden. "I think it's grossly inadequate and I hope that we can help a little bit."